If you want to skip the story and get right to the HOW, scroll down to the HOW. Otherwise, we learn a lot from other people’s stories, enjoy mine. 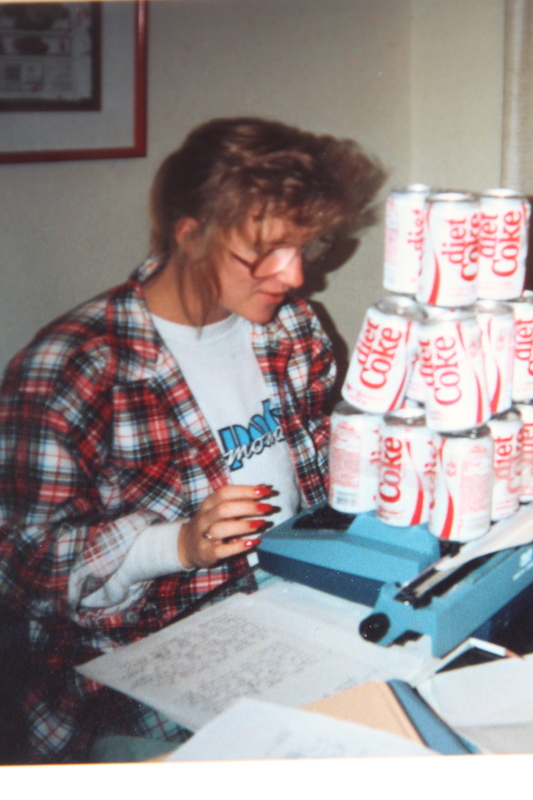 Me in college, the only photo I have of me studying through all my school days. But, hey, there is my trusty typewriter and my research paper next to it. The Coke was a joke, but we did drink a lot of it back then. However, research papers were something I could do and do well. It just required long hours of work. Long hours of work, that I could do. And, I got very good at it. So, my mom and I would spend days, weekends, weeks even, filling out note cards with information from the Encyclopedia Britannica or other books we would check out from the library on my current topic. (Sorry, no computers back then.) We would make a bibliography and then put it all together in one grand paper. I’d type it up (on a typewriter of course!) and I’d get an A, mainly because my papers were well written, but also longer and more extensive than any others in the class. I put in the work and in the end, got very good at the process. This saved me in college where I graduated with honors, again not because I was the brightest bulb in the lamp but one of the hardest working for sure. Today I am encouraged to share with you HOW I work with Reiki and my Reiki guides to do my blog writing to maybe encourage others of you to do your own writing with Reiki. Reiki enhances ANY creative process that we do by offering Higher Guidance, Divine access to information and ideas and timing that will relate to the people who need to be reached at the exact time they need to be reached. 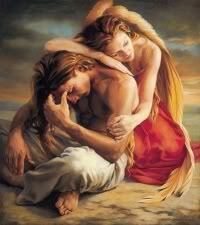 One of Archangel Gabriel’s specialties is creativity. 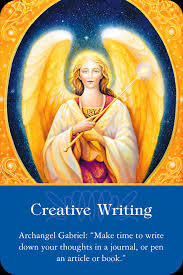 Call on Archangel Gabriel to help you get motivated or any aspect of writing you need help with. Blogs are great for this process because I could write a blog to be read by one person now, the person who my guides encouraged me to write the blog for initially. But then, years later, another person will find my blog and read it and it will speak to them as well. It will be just what they needed to read. Their guides help them find my blog on the internet even when they weren’t researching Reiki. I’ve heard this from my clients many times over, “I don’t even know how your page popped up, I wasn’t even researching Reiki, but it did and I read it. It was exactly what I needed but didn’t know it.” The internet is a fabulous tool in this way and consistently amazes me. My Reiki guides help me with all of this. No detail is too small for them. When we truly listen to our Divine Guidance every day, trust it, act on it we are in the flow of Divine Energy and our timing will always be right on. Our guides make it so. I also believe that our Reiki Guides work with us within the framework that we have in place currently, our human brain, which we chose for our exact purpose before we came here. In my case, my human A.D.D. brain which is perfect for the intuitive process, not so great for memorizing details, is perfect for what I am meant to do in this lifetime; heal myself and others. Our guides do not change us, make us “better” or turn us into an award-winning writer when we are not meant to be one. I believe they work with the gifts we have chosen currently for this life, and that they believe we are perfect just as we are. We come into this world with all the gifts we need, expand them, work with them, be grateful for them and they will grow. We chose to come in with these gifts for a reason. I was not meant to be the author of the “Harry Potter” series but the author of a Reiki blog for Reiki students. I have the gifts and talents for that-perfectly. I work within this framework with my guides while continuing to learn and enhance my abilities as I go. If I waited until I was a fabulous writer before I ever wrote, I’d never write. I say all this, because I want us to stop the negative talk that we do to ourselves. It hurts us in so many ways, it doesn’t help. You are exactly as you are meant to be, be grateful for it and learn how to work with it. Learn what your gifts truly are and enhance them, work with them, be grateful for them and you will expand and grow beautifully. I’ve found it doesn’t help to put myself down for the abilities I don’t have (like a tremendous vocabulary, that is what a Thesaurus is for,) but to be grateful for these gifts I do have and come from a place of gratitude as often as possible, and it is often possible. Through gratitude of what we currently have, we gain more. BE GRATEFUL FOR WHO YOU ARE NOW, IT IS EXACTLY WHO YOU ARE SUPPOSED TO BE!! 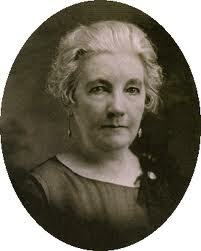 Laura Ingalls Wilder, my long time hero, did not get her first book published until the age of 65. She is an inspiration to me, that it is never too late to start something new. She was a farmer’s wife for many years, started writing articles for local journals and expanded her abilities along the way with practicing for these journals. She finally wrote her first book because they had lost all their retirement money in the Great Depression and needed something to live on. That was motivation. Timing. Having said that, if you feel drawn to writing, then write. Don’t wait, just do it! 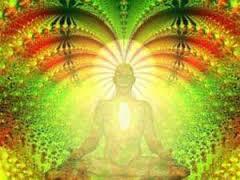 Meditate – in a perfect world I’d meditate before each sitting to write. I do this often, but sometimes my ideas come when they come and I write “on the fly”. This is preferred but optional. Get Centered and Grounded – with or without mediation, spend some time intending and visualizing being centered and grounded. Prepare yourself with the right atmosphere for you to write; time alone, nice calm music, quiet, door closed, etc. Sometimes I don’t have any of these and manage to write anyway. Do what you can when you can. Don’t let the ‘perfect’ setting keep you from DOING IT! I have kids and pets, the setting is rarely quiet and perfect for writing, but I do it anyway. 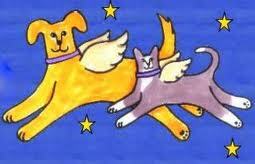 * Gassho – Bring in your Reiki and Reiki Guides– I do this with the Gassho method. 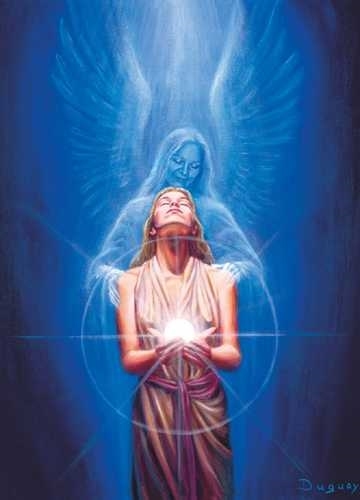 With my hands at my heart in prayer position I respectfully ask for the Reiki to flow. With my hands at my third eye, I ask for the Highest and Most Spiritual Order of Reiki Guides with the intention of writing a Reiki blog to come and help me in all ways needed. Prayer hands back at my heart I intend for Grounding, Centering, a Pure Heart and a Clear Channel for the Reiki to flow. I imagine the Reiki flowing into my crown chakra from Divine Source and flowing down through my brain, through my heart and then through my hands for the typing and out to the keyboard. I type directly onto my blog. I first tried to type onto word or write the blog onto paper and transfer it, but no, that didn’t work. For me I found for the flow to flow the best, I needed to blog right onto the blank blog ‘paper.’ Do what works for you. Try different methods but your guides will tell you what is best for you quickly. *LISTEN to your Higher Guidance while typing for ideas and phrases that work best. This may be the hardest part, the listening. But, also one of the most important parts. You’ve got nothing to lose by listening but a lot to lose by not. WRITE– I write differently every time. Sometimes I start with just an idea and work on it later. Sometimes I’ll write the whole blog in one sitting and then edit. Most times I take many sittings to write a blog, re-write, research, pictures, and editing. The process is part of the learning and timing as much as anything. *Reiki Yourself – Be kind to yourself in the process. Reiki yourself if you start having blockages come up. Talk to yourself like your very best friend would to help get you through any road blocks to writing. Reiki yourself some more to heal the issues we talked about up above. 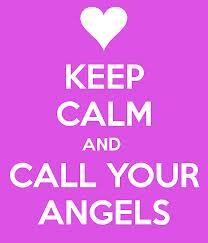 *Communicate with your Reiki Guides regularly I tell my guides to being me ideas for blogs anytime. I write them down or get the blog idea started and then write it later. This way I am always open to the intuitive flow of ideas coming from Divine. Yes, we need to tell our guides what we want and they will do it for us. Ask and say Thank You! I pray this encourages some of you to do that little creative thing that has been pestering your mind and spirit lately, whether it be writing, painting, singing, drumming. Any creative pursuit is enhanced by running Reiki at the same time. Reiki makes the world a more intuitive and beautiful place. I envision a very resplendent world myself and you and Reiki are all a HUGE part of it.